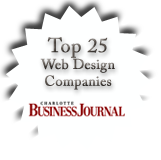 We're a Top 25 Charlotte Web Design Ranked Company specializing in website/cyber security, content management systems, mobile app development, application and database development, website design, ecommerce and social media marketing. We transform static websites into powerful applications by plugging them into our Morphogine™ Platform, which consists of a growing list of modules such as content management, e-mail marketing, search engine optimization (SEO), e-commerce and social media systems. If you're looking to have a new website designed/developed, secure/fix an existing hacked website, integrate a cms, integrate a shopping cart, have some SEO done or pretty much anything in between, then you've come to the right place. We don't use any off-the-shelf products - all of our software is home-grown, tried and tested and we offer unbeatable support. Give us a call today +1 888-58-CYBER (29237) or request a proposal online.